With competition in the logistics sector driving prices down and squeezing already razor-thin margins, providers are being forced to offer better service to win new customers and retain their top accounts. But many companies still rely on manual processes for scheduling shipments, monitoring changes, updating customer on statuses and handling exceptions, slowing operations and hindering your ability to grow revenue. 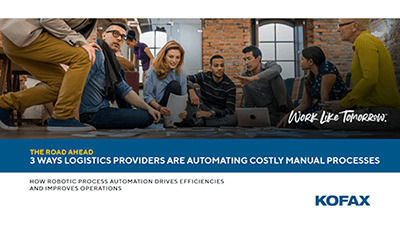 In fact, according to an independent survey of manufacturing and logistics executives, only 24% stated they have implemented automated processes to improve the visibility of order and shipment status. Yet they also stated their key focus was on reducing risks that affect customer relationships. Kofax RPA for transportation and logistics enables you to eliminate costly manual functions by automatically acquiring, integrating and delivering data across your supply chain. Now you can efficiently exchange information with your shippers, carriers, logistics partners, freight bill payment processors and other trading partners. 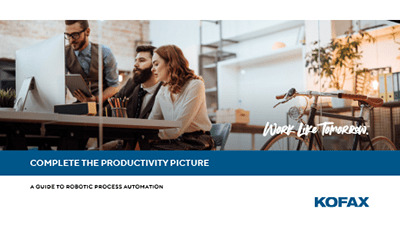 Increase staff productivity, service levels and your capacity by deploying robotic process automation (RPA) for repetitive, manual data entry tasks. Free up your employees to focus on your customers and more valuable work. Identify trends and patterns that can help you optimize operations and logistics management. Automatically perform rate look-ups from multimodal carriers and 3PLs. Eliminate manually copying of data from load boards and emails into internal systems and then copying it back into B2B portals to report shipment status. Obtain better information to create new opportunities, innovate supply chain processes and achieve greater financial success. Leverage information in near real-time to adjust demand forecasting and logistics planning. Identify trends and patterns in supply and demand, weather conditions, and how those trends impact delivery.